Rosie got many points with her novice owner handler Marie Inman in North Carolina including a major win and other points on the very tough Tar Hill Circut. I hate to report much to Marie's dismay I did finish her while I had her to take to the specialty-for that I will always be sorry as Marie did such a good job herself. 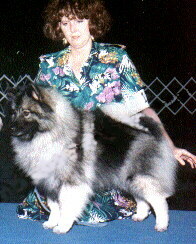 Marie has finished the CH on one of Rosie's get Tina and has placed her many times as BOS against some top contenders.